Enjoy full usage of the latest versions of Word, Excel, PowerPoint, One Note, and Outlook. Share your subscription benefits with up to four members of your family. Install Microsoft Office 365 on up to five devices per user, including PCs, MACs, Tablets, and phones. Access your files from everywhere with 1TB of OneDrive Cloud storage per user. Home TVolution requires a Fibr or DSL subscription. With the PLDT HOME TVo Stick, access sites like YouTube, Facebook, streaming media services, and browse the net right in your living room. 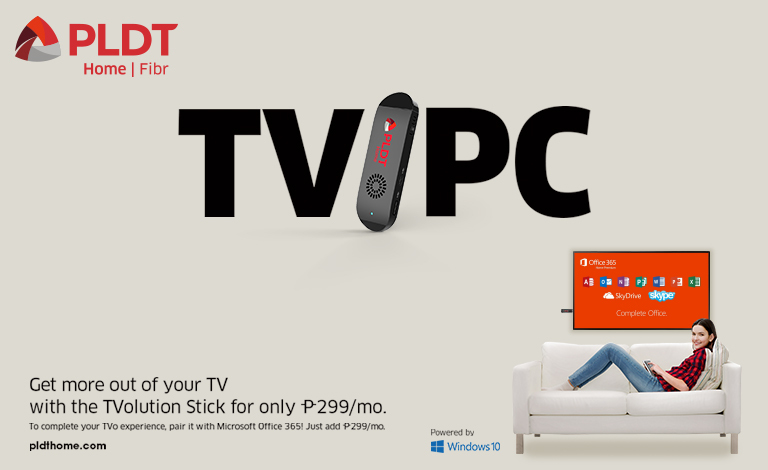 Simply connect the PLDT TVo stick to your TV, connect it to your Wi-Fi, and use a wireless keyboard for navigation. By using this small and innovative streaming device, you can transform your HDMI-ready TV into a full-feature Windows PC. Choose from our plans now to start enjoying your Internet TV experience.